The control statement that allows us to make a decision from the number of choices is called a switch, or more correctly a switchcase-default, since these three keywords go together to make up the control statement. A switch statement allows a variable to be tested for equality against a list of values. Each value is called a case, and the variable being switched on is checked for each switch case. 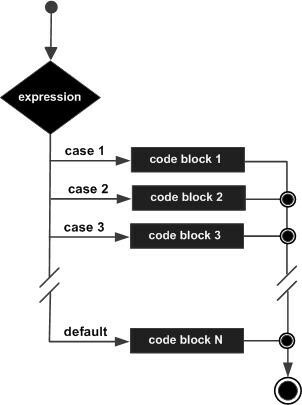 The switch statement executes the case where a match is found and all the subsequent cases and the default as well. To solve above problem by usinf Break keyword.